1. The project aims to improve traffic flow and decrease traffic congestion on the I-710 freeway between downtown Long Beach and the junction with the SR-60 freeway. This section of the freeway has very heavy truck traffic due to trucks traveling between the Ports of Los Angeles and Long Beach and railroad freight yards near the I-710/I-5 interchange. Truck traffic from the Ports of Los Angeles and Long Beach often contributes to congestion on the 710 freeway. 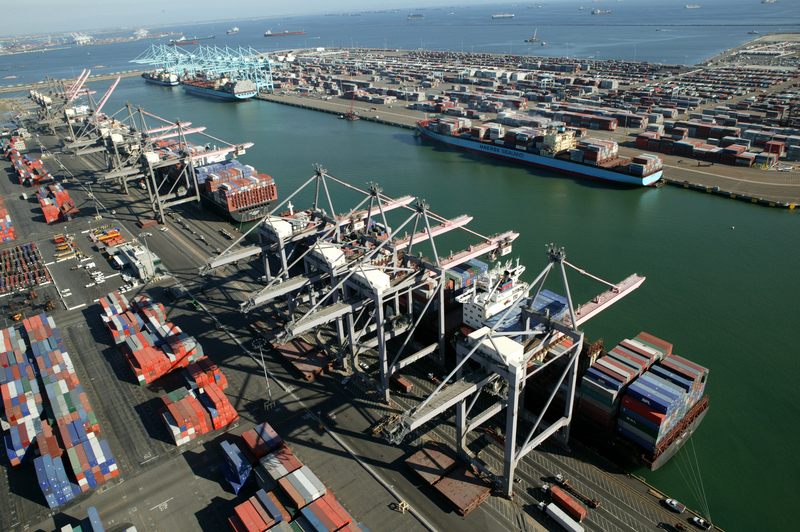 Credit: Port of Los Angeles. 2. One project alternative (Alternative 5C) proposes to widen the I-710 from the current six lanes up to eight general purpose lanes south of the 405 freeway, and from the current eight lanes to 10 general purpose lanes north of the 405. Truck traffic from the Ports of Los Angeles and Long Beach often contributes to congestion on the I-710 freeway. This alternative would also improve interchanges, ramp meters and traffic signals along the I-710 corridor and provide upgrades to local transit. The I-710 would also be shifted at various locations to reduce right-of-way impacts. The cost for this alternative is estimated at $6.5 billion. 3. 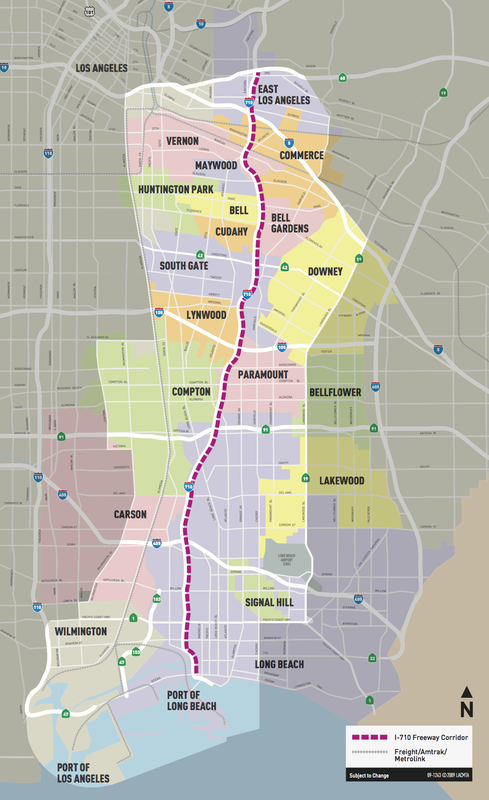 The other main alternative (Alternative 7) would add a “clean emission” freight corridor from Long Beach in the south to Commerce in the north, as well as make necessary improvements to local and freeway interchanges. The cost of this alternative is estimated at $11 billion. 4. The I-710 freeway opened in the mid-1960s. In the time since, the region’s population has significantly increased and the amount of freight coming into the ports from Asia, in particular, has grown. Truck trips along the I-710 Corridor are expected to nearly double by 2035. 5. Air quality would be improved and public health risk would be reduced at most locations along the I-710 Corridor if the project is built, according to Caltrans. Air quality in particular will be helped by new regulations that will lower emissions from trucks and other vehicles, the study found. A recirculated draft environmental study for the project was released on July 21st by Caltrans and Metro. Three public hearings will be held. There is about $1 billion in current funding available from Measure R and Measure M. Selection of a preferred alternative and certification of the environmental study will allow Metro and Caltrans to identify other funding sources. Visit the project’s home page on metro.net to learn more about the study and the project. Probably the best thing that can be done to ease truck congestion for the 710 is to create some kind of “truck only” lanes that occupy where the carpool lanes would go and create separate exits/interchanges for those lanes so that trucks can express from the port to the freight yards/SR-60 without interfering too much with regular car traffic. Every time that I’ve taken the 710 during work hours it can be quite difficult to try to cross the wall of trucks to make it to your exit in time. Am I reading correct that the majority of the truck traffic is for transferring ocean freight in Long Beach to rail freight in Commerce? Could heavy rail be built along the corridor to eliminate one transfer? Not sure if “majority” per se but certainly a significant part of the truck traffic is coming from the Ports. The Alameda Corridor already connects freight trains to the ports. I think the issue is that not everything coming out of the ports is on trains — a lot of it travels by road, often to the rail yards near the 710/60 and some to other destinations. What Metro desperately needs to do is to join forces with BNSF to get constructed their Southern California International Gateway (SCIG) project, an intermodal rail facility near the Ports of Los Angeles and Long Beach that would have eliminated millions of truck miles from the 710 Freeway each year. The SCIG is on hold because a judge rejected the SCIG EIR due to local environmental issue but because of CEQA could not consider the reduction in truck traffic on the 710 due to containers now traveling to inland yards via the Alameda Corridor. See http://www.bnsfconnects.com/content/home for info on SCIG). Completion of SCIG could be a win-win situation for both BNSF and Metro. That is correct. There have been efforts to consolidate warehouses near to the port so all shipments can go by rail, but I’m not sure what the current status of those efforts are. If that ends up happening, these improvements to the 710 will have been a waste of money. Convert 1-2 lanes in each direction to HOV/Toll lanes. Do NOT widen this or any freeway ever again. Freeway widening projects waste billions and accomplish literally nothing, since new unmanaged demands simply induce additional freeway use. Remember how well Metro’s 405 widening project went? Not well, and it did NOTHING to reduce congestion. Just say no to freeway widening. For what it’s worth (probably nothing…) i second the stupidity of lane widening. It’s proven to have marginal effects (if any) on traffic and is undoubtedly the least sustainable method of mitigating traffic. How would Option 5C upgrade local transit? routes within the I-710 Corridor area. Obviously the reference to the Connector is dated as that project is under construction with a 2021 forecast for completion. The project also proposes to make traffic signal upgrades on arterials along the 710, which could benefit transit. trucks? I guess natural gas would be consider “clean emission” trucks. i was just curious if they are ever going to finish the left lanes.. seems like they have been working really slowly for 2 or 3 years in the one section just south of the 5 /710 interchange. was there no final / finish by date put in the contract . the risk to lives is a lot when they close the some of the lanes every night for years .. its really interesting to see people moving to the right before the trucks have even pulled out into the left lanes to shut it down… drivers are way too well trained.